On the left, the WRAP STACK Ring rests our KESHI Ring, a large irregular pearl set in silver handcut prongs. The STONE Bracelet and BOLD Cuff are worn together on her wrist. Mekdes wears our large DISC Hoops, narrow circular disc with the form of a classic hoop. Keeley wears our FLOAT Ring. 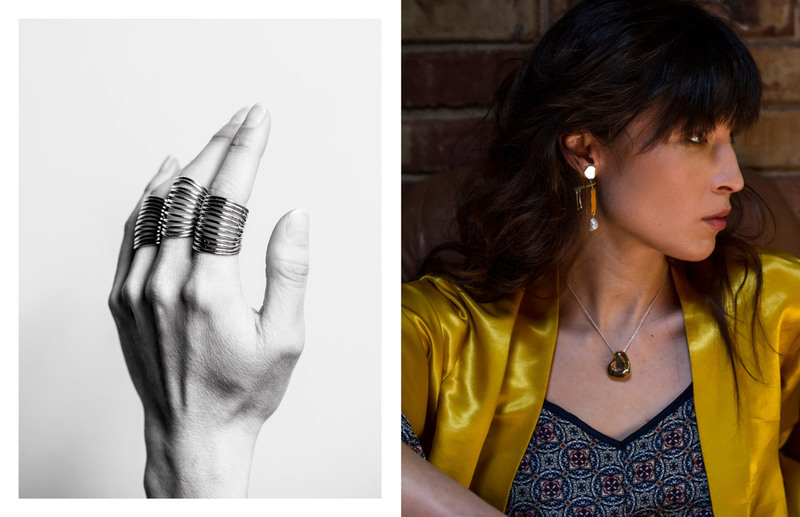 It’s a comfortable sculptural ring that floats above your fingers and is complemented by our BOLD Cuff. Lauren wears our WRAP STACK Bracelet, composed of connected bands. Alongside are our KESHI Bracelet and CUTOUT Bracelet, both minimal and eccentric. Shining bright on her middle finger is the FLOAT Ring in silver. The playful silhouette of our DOT EARLASH chimes in her ear. 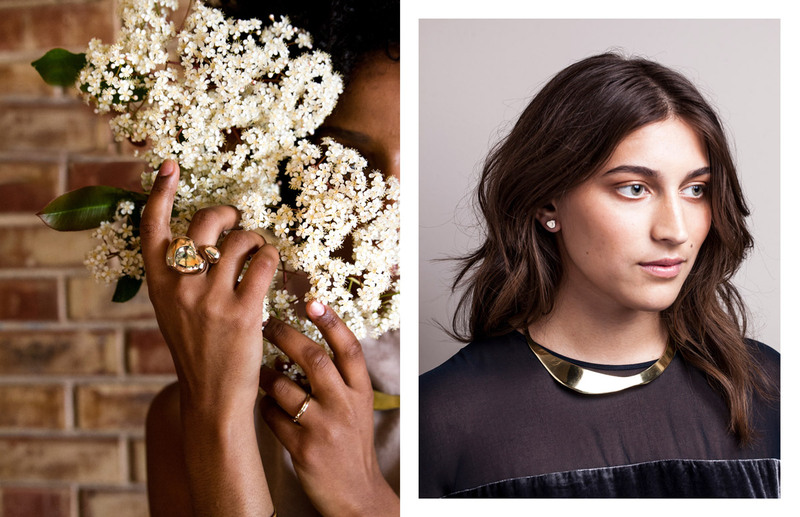 On the following page, our molten bronze NUG Necklace hangs above our slender SLICE Necklace. 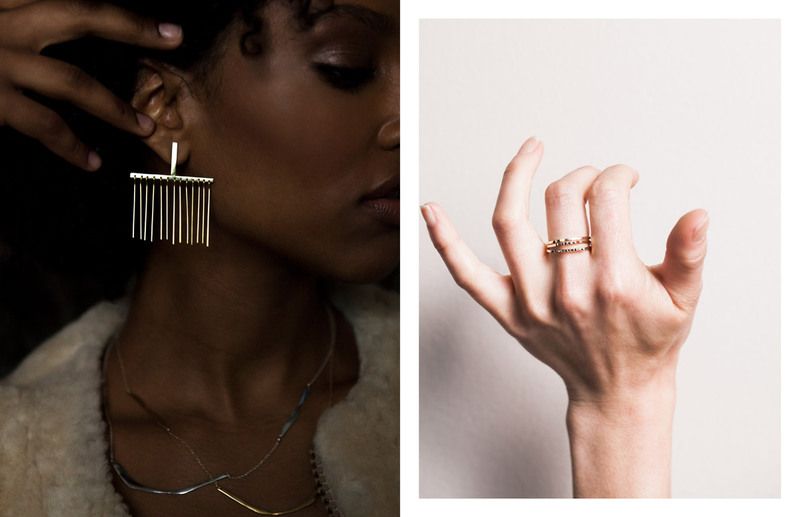 And on her hands are the FLOAT Ring, CUTOUT Rings, WRAP STACK Ring and BOLD Cuff. Above the WRAP STACK Bracelet, STONE Bracelet, CUTOUT Ring and WRAP STACK Ring are worn together. To the right, Keeley shines with our DOT DROP Earrings, where a circle meets a line. The STONE Choker bends and beams in her shadow. Mekdes wears an irregular pearl strung on a delicate chain, our KESHI Necklace. Her jumper features a silver hand-cut abstract HIP Pin. Combined with our DOT DROP Earrings, BOLD Cuff, STONE Bracelet, KESHI Ring and WRAP STACK Ring. On this page, our CLOUD Necklace commands attention. A whimsical bronze sculpture with cloudlike curves. Below is our SLICE Necklace. Handcarved to meet your gaze and touch. To the left, layers of WRAP STACK Rings add intrigue and shine for any occasion. On the next page, Lauren wears our MOBILE Earrings, a small ode to Calder, made of handcut silver and bronze, cantilevered tassels and an irregular pearl. The NUG Necklace, a molten mercury thumbprint, rests on her neck. To the left, Mekdes blossoms beneath CUTOUT Rings stacked two high. Their slender texture offers tactile pleasure. On her other hand, our FLOAT Ring shines again. Keeley wears small pebble-like DROPLET Studs in silver. Around her neck is the STONE Choker for added brightness. This page features our STONE Bracelets, CUTOUT Bracelet, KESHI Bracelet, FLOAT Ring and WRAP STACK Bracelet. Lauren catches moments of light around her neck wearing the slender GLINT Choker. Our MOBILE Earrings dance from her lobes. On the left, Mekdes’ lobe gleams with a LINELASH. In the shadows you’ll see CUTOUT Necklaces, irregular slender shapes composed delicately. To the right, RANGE Rings I, V and X. As a set, they form a gemmed pyramid. Individually, they are slender rings with a platform ridge, each laced with black diamonds.